For IMVU, skeletons generally refers to a hierarchical control structure that influences the behaviour of a particular item or product. A typical example of this would be the skeleton used to control avatar movement, without one nothing happens, the character remains little more than a collection of meshes fixed in place. 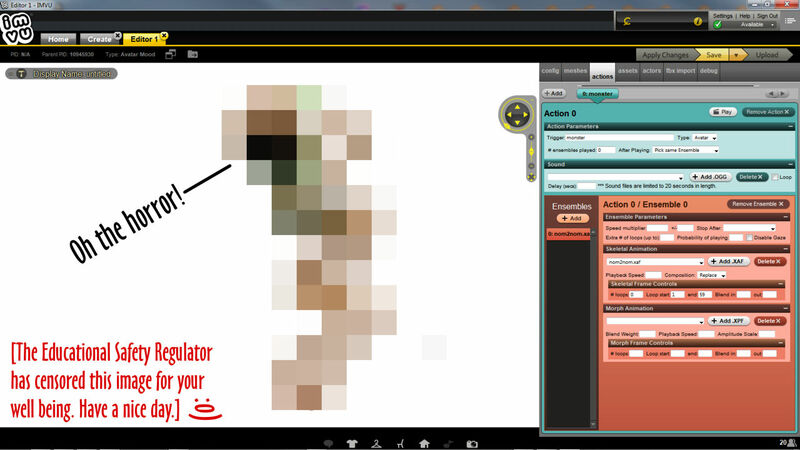 This is true for all items in IMVU, each having their own version of this underlying skeletal control structure for proper operation as avatar, furniture, rooms etc. Help I’m stuck!. You Are?. An underlying skeleton of some kind is needed for products to work properly in IMVU, even if that means using one that’s derived. How skeletons are able to control other objects is down to their construction; they typically contain a number of sub-components, each acting as a control for specific sections of any mesh or meshes they might be associated with. For example the skeleton controlling the avatar has sub-elements called bones linked with different sections of the avatar meshes. 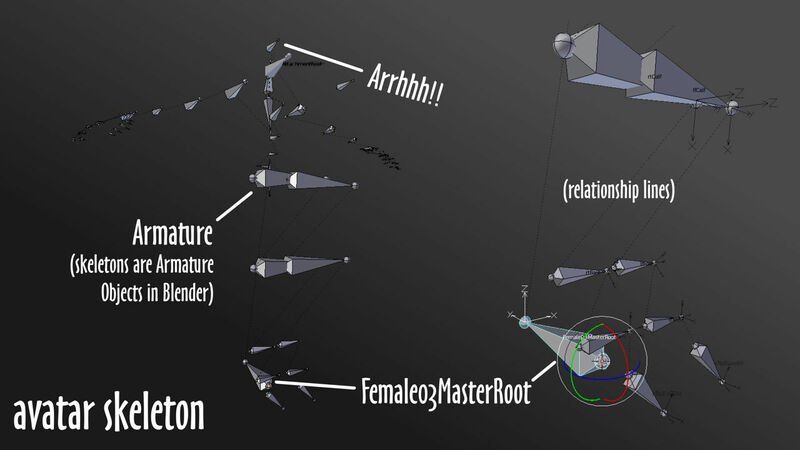 In practice it’s these sub-elements that actually do the all the manipulation and articulation of the meshes they might be associated with; when the avatar moves, its not the skeleton (Armature in Blender) that moves so much as one or more of the bones it contains. I know yoga, just like Keanu! Although there are some limitations to just how far bones can be manipulated without causing undue mesh distortion, they can be used to create effective poses nonetheless. It’s important to keep in mind that skeletons are hierarchical control structures rather than being something specific that might facilitate making a particular type of item or product for IMVU, the avatar skeleton would be an example of this because its fixed, it cannot be changed and is used only to create avatar specific content (poses, clothing, avatar animations) – bones or other control elements cannot generally be added to, or removed from the avatar skeleton else the avatar breaks. Skeletons for other products differ slightly in that, whilst they generally need to adhere to a set structure, or contain core elements, they can be heavily customized; sub-components can be added or removed without necessarily breaking the product in IMVU. Furniture, Rooms and animated Accessories are a good example of this; not all rooms need to include ceiling or wall nodes; not all furniture needs to have avatar seating; not all accessories need be static. Hmm, I prefer… sitting!. Many product skeletons have basic requirements that can be augmented with optional extras, like seating for furniture items. Furniture rooms (rooms into which Users can place furniture items) can be quite complicated to make because their skeletons include a number of different sub-elements that each perform a particular function relative to the room and a Users interaction with it. 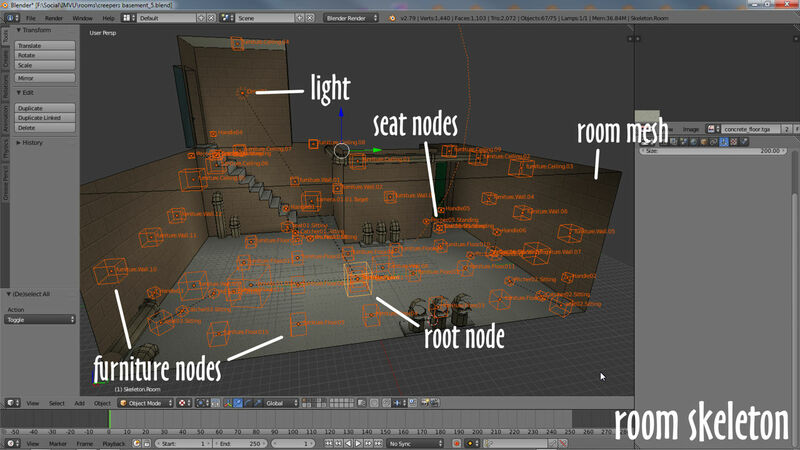 Like other items room skeletons have a hierarchy, the very top of which is a ‘master’ node, appropriately named Skeleton.Room, to which the remaining parts of the skeletal structure connect; nodes for furniture, nodes for seating, camera, lighting, and optional nodes for animation. 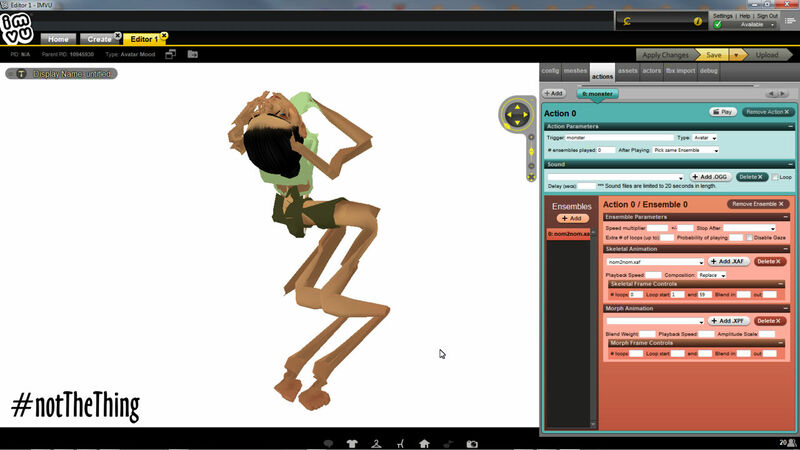 A typical furniture room has a skeleton made from a number of different sub-elements for specific functions in IMVU, furniture nodes for furniture items, seat node for avatars etc. Furniture items are the simplest product in IMVU as their skeletons can function with just the single bone, called Root (casE SenSiTvE), necessary to anchor the item in place when its loaded into a room – so long as the root node is present, and the furniture mesh is properly linked to it in Blender, the item can be exported and assembled in Create Mode. 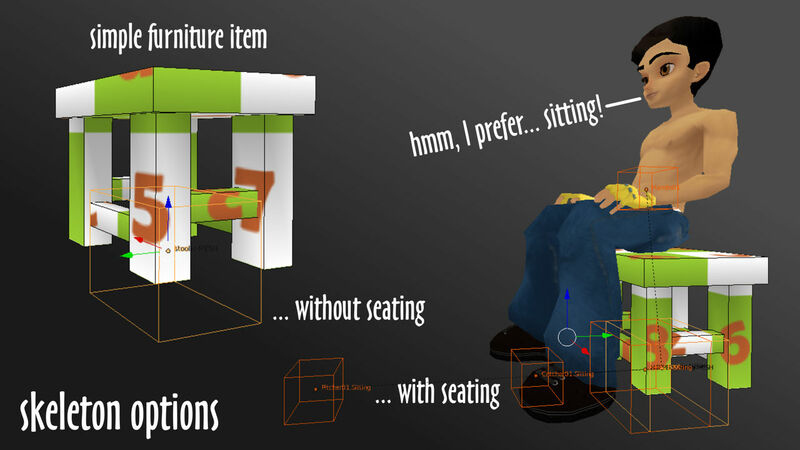 More complex furniture products are also possible but require more involved skeletal structures to accommodate the additional features, extra nodes for animated elements or avatar seating/pose spots for example. Covfefe Table! 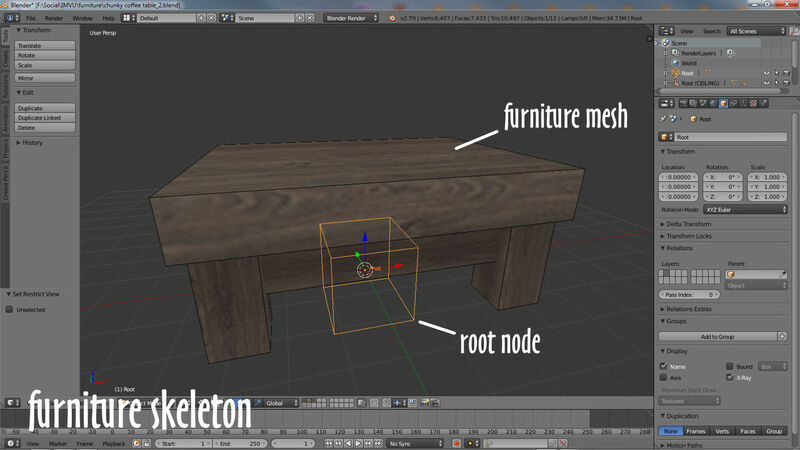 All furniture items needs a skeleton, the simplest being a single node in Blender called Root. The skeleton used for Accessory items is another one of the more basic skeletons IMVU products can use. In essence it consists of two bones, the root being AttachmentRoot around which the item is built. Once made the item is then linked to the corresponding bone in IMVU (Attachment Node), unlike other products this generally means projects don’t need to be centred on Blenders grid (items are generally built where they are to appear). Accessories can be basic items like earrings or bracelets, or animated, for example a spinning box or animated tail, which typically means adding extra, optional, bones and animations. Bling!. 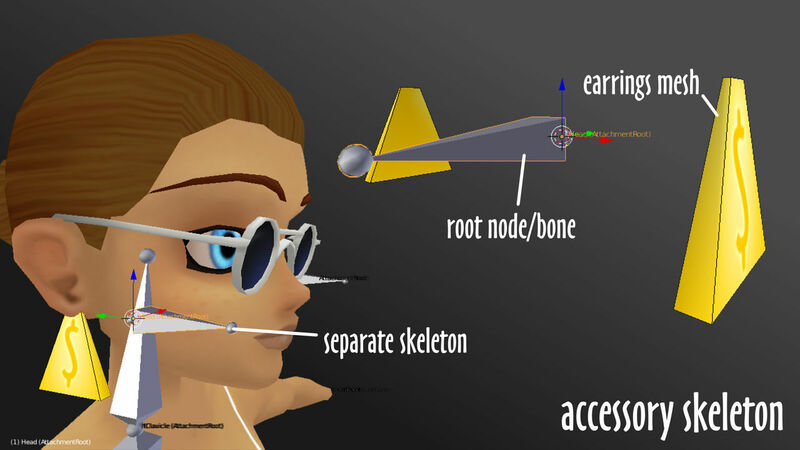 Accessories have their own skeleton, typically two bones that can be linked to the avatar in Create mode via the Attachment Node setting. The avatar skeleton is the one item Creators don’t need to make, its ready-to-use right from the appropriate Starter File. It contains 87 bones individual bones, 86 specific to the avatar +1, zHead, for Pets. The bones are all arranged into a hierarchy, at the top of which is Female03MasterRoot. This root bone also serves as a positional device, locating the avatar relative to seating and other interactive nodes in rooms and on furniture. 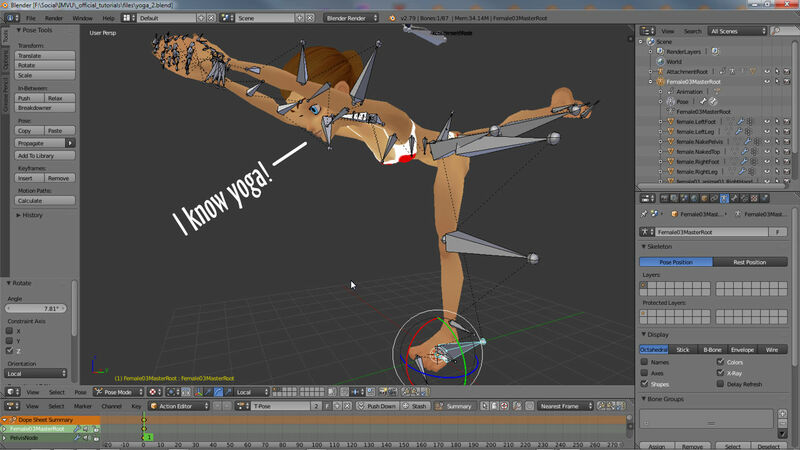 When posing or animating Female03MasterRoot doesn’t move, it stays put regardless of the sequence and is always positioned at grid-centre in Blender (xyz 0,0,0). Arrhhhh!. The avatar skeleton consists of a number of bones arranged into a hierarchy that can be manipulated to create poses with Female03MasterRoot at the top of the tree.